He graced our television sets with live reports from the most recent conflict between Palestine and Israel. Now that a ceasefire has been reached, British filmmaker and human rights advocate, Harry Fear, has embarked on a world talking tour to share his knowledge about the social, political and economic ramifications from a firsthand perspective. He arrived in Toronto Monday, amid much ado from Canada Customs the moment he stepped off the plane. That curious greeting will leave a lasting impression; complete with grilling about his political perspective, examination of his website, a list of domestic associates and questions regarding which side he supported. It used to be that a British passport could get you into Canada, but now not so much. Now it depends on where you stand and if your freedom of speech is acceptable to the Harper government. Thankfully Fear passed the interview and wasn’t turned away like British diplomats before him, due to peaceful and sympathetic views that include the Palestinian people (see MP George Galloway). Sometimes we’re luckier than we know to receive communication from the outside world and in this rare glimpse; Harry provides extensive interview to help us understand what our handlers already had the benefit of gleaning from his experience. 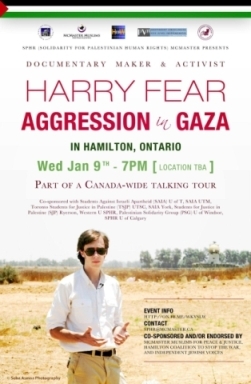 Fear’s lectures, Aggression in Gaza – A Talking Tour, are scheduled for numerous venues across the country. Tonight, he speaks at University of Toronto, followed by engagements at respective universities in Hamilton, London, Windsor and Calgary. Due to the overwhelming response, more dates and locations in various provinces are still being determined and you can keep an eye on the itinerary here. For those who can’t make it, he was kind enough to provide us with two hours of intimate answers to our deepest questions, unedited. Via Skype video recording, Harry Fear compels us to think harder about what we’ve been told. He points to concerns about our current leadership’s role in perpetuating the conflict by taking a hard stance that may not be conducive to a peaceful resolution. In fairness, Fear identifies a North American mindset that falls short of grasping the repercussions or why it is so important for us to sit up and take notice. These topics do not shy away from what amounts to controversy in the western world. We do, however, stand alone in our foreign affairs policy toward the situation, as seen by the United Nations vote for Palestine’s observer status and our lonely opinion against them. One hundred and thirty eight countries gave their nod of approval and Canada was amongst the nine to object. We’re also in the minority to label Hamas a terrorist sect, but Harry does a thorough job of explaining international law and how our opinions translate on the streets of Gaza. Not only was Fear present for the onslaught of bombing in Operation Pillar of Cloud (aka Pillar of Defence), he is also a scholar from Oxford in the discipline of political science. In our personal exchange he goes on to explain the reason for that name change, in that Pillar of Cloud is a religious reference to a children’s playground. It might not have been good optics in a public relations war, that sees them dying and sometimes burnt to the bone by white phosphorus. From the bombing of kindergarten humanitarian schools on International Children’s Day to the demoralization of depending on foreign aid for food, Harry Fear is not too timid to express in real terms what their day to day reality is like. He is passionate about this suffering and urges us to understand the majority of civilians in Gaza are children. He says the violence and occupation punishes them as if they were responsible for the adults and world politics. Fear also paints a picture of arbitrary detention, in a system where kids are imprisoned and even tortured for throwing stones. He describes some as having to defend themselves in a foreign court, in a foreign language, all alone. Moreover he amends the terminology of PTSD to say the children are coping with “continuing stress disorder”. This presents with symptoms of bed-wetting, separation anxiety and consistent shell shock that does not have a chance to heal. The dialogue isn’t nearly confined to children though and broaches topics such as apartheid, “with a small ‘a'”. This involves road systems that Palestinians aren’t allowed to use in their own territory and colour-coded licence plates to alleviate racial profiling by identifying their vehicles for interrogation. In other strange measures, Palestinian males can be guilty of a crime for failing to announce their ethnicity to a prospective sexual partner. Nearly every aspect of the Israel-Palestine conflict is touched upon in this account, underlining unemployment, education, Hamas and perceived terrorism, as well the dangers to Israeli citizens. But where the West has been led to believe the Jewish people strictly oppose Palestinians, he challenges us with information about their protests in support. Fear outlines the difference between a Zionist, an Israeli and those who practice Judaism, explaining many Jews decry the occupation and complain their religion was hijacked by politics. Contrary to North American beliefs, the truth of the situation is that Rabbis for Human Rights are some of the most active Israelis campaigning against the illegal settlements in search of peace for all (in English and the original in Hebrew). Fear offers a balanced and honest assessment from both perspectives, right down to the pros and cons of Palestine obtaining observer status. He breaks down the structure of their government, so Canadians are able to understand the nature of each territory, the reasons for disjointed leadership from the West Bank to Gaza Strip and where they’ve been able to work together. He discusses the different tactics of oppression in each of the areas. In Gaza it’s predominantly violence related and an open air prison, surrounded by the Israeli Defence Forces. In the West Bank it’s entirely occupied and they rely on humiliation, complete with constant control of Palestinian movement. He brought this message to Canada and the U.S. to draw attention to superpowers that are aiding and abetting the occupation. One example through my research is the Canada Pension Plan. Our citizens are retiring based on our government’s investment in the very companies that supply arms and build the illegal wall (more here, including photographs). Harry mentions the G4S company, that provides armed security for illegal settlers also contrary to international law. A number of significant entities have already divested to clear themselves of supporting that violation as well as the maltreatment of child prisoners. And yet here is G4S Canada, thriving without an ounce of recognition in the Canadian consciousness. Our collective CPP investments (domestic companies list and foreign companies list — PDF) include Elbit; responsible for drone smart cars and the newest patrol of Palestinians with the ability to kill by remote control. Whether it’s on the ground or in the air, drones are being used to target citizens 365 days a year regardless of any ceasefire. Our retirement is doubly invested in CAE, which has partnered with Elbit to provide similar technology on Canadian soil. The University of Alberta partnered with the government in Alma, Quebec, to develop and test Israeli drones for greater human impact and profit. This was accomplished through an Israeli economic mission to Canada last spring, unbeknownst to most Canadians. So not only is our retirement tied to keeping the conflict going, but we’re also developing the unmanned machines to kill Palestinians in our own backyard. Finally Fear addresses the Canadian government, asking the Harper Conservatives and federal Liberals to rethink their stance in support of Israeli violence without question. He notes the NDP may have represented our country better under Jack Layton and was surprised to learn even they haven’t condemned the occupation or spoken of divestment under new leadership. In the video he encourages everyone to visit IfAmericansKnew.org to get a real handle on the numbers and to visually grasp the disparity between them. Fear describes the Israel-Palestine conflict as a case of David and Goliath and asks us to take one minute out of each day to learn more, write a letter or anything we can to make a difference. A solution must be found and 60 years of suffering hasn’t improved by us ignoring it. The rest of the world doesn’t perceive Canada as the good guys anymore and it’s high time we restore our reputation for the benefit of these many children. Without further explanation, here is the answer to every burning question you’ve ever had about Palestinians and what Fear was able to see for himself. If you would like more information, please visit HarryFear.co.uk or GazaReport.com. You can also follow Fear on Twitter via @HarryFear.